“Why Exodus?” It’s a question I’ve gotten dozens of times surrounding the publishing of my book The Gospel-Centered Life in Exodus for Teens. Usually it comes with a hint of skepticism because I think what is really being asked is whether a teenager is actually going to want to read an Old Testament book like Exodus. Quite frankly, many Christians probably do flip right on by to the New Testament failing to see how an Old Testament book is relevant, which is exactly why I choose Exodus. In no other book is God’s pattern for redemption laid out more clearly than in Exodus. We have the Israelites, who continuously spurn God’s love even though he chose them as his children. And we have God, who despite the Israelites’ grumbling, complaining, disobedience and false worship, is faithful in his steadfast loving-kindness. But the journey of the Israelites out of slavery through the wilderness in pursuit of the Promised Land is not just the story of the Israelites--it’s our story, too. We are no different than the Israelites in our sinfulness, and God is no different to us in his goodness. Just like with the Israelites, he comes to our rescue, showers us with an abundance of grace and seeks to be in relationship with us. We miss this when we read Exodus as a history book. So, for the teenagers whom I first led through a study of this book, it was eye-opening to see Jesus show up in such unexpected ways throughout Exodus. Albeit concealed in shadows and signs, on every page of Exodus, and all throughout the Old Testament, is the story of Jesus and our need of him as our Redeemer King. 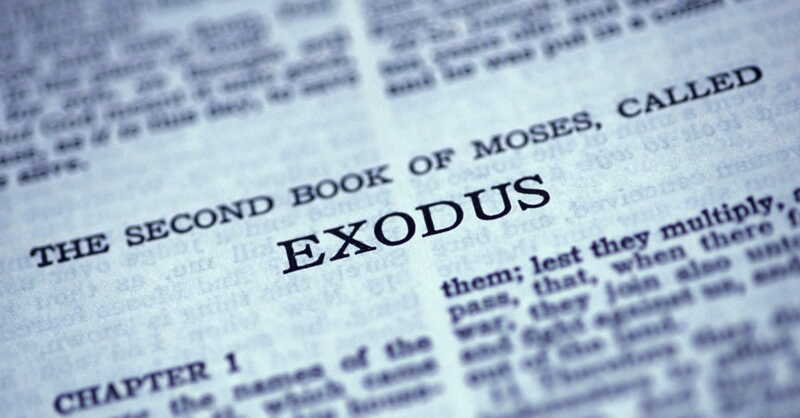 Let’s take a look at just five of those passages where you may have missed seeing Jesus in Exodus. After Pharaoh and his people were warned about the coming final plague, the Lord gave Moses special instructions for the Israelites to escape the killing of all first-borns. Each household was to smear blood over the doorway as a sign for God to pass over them and not execute judgment. But in order to get the blood, a sacrifice had to be made. As stipulated by God, the sacrifice was to be an unblemished one-year-old male lamb—thus, the Passover Lamb. Now fast-forward to the New Testament. Jesus had gathered with his disciples to celebrate Passover as the Israelites had done in remembrance of the Lord’s faithfulness to the Israelites ever since their escape from Egypt. This particular Passover Meal would be Jesus’ Last Supper, as it was right before his impending death. What the disciples didn’t yet know is the One presiding over the meal—featuring a sacrificed lamb—was himself the promised Lamb of God! Jesus was about to fulfill perfectly what the sacrificial lamb of the Passover in Exodus pointed to. When the Israelites complained of hunger in the wilderness, the Lord answered by raining bread down from heaven. Day after day, he continued to do so. But after a while they lost sight of God’s provision and grew tired of the same old bread. They wanted something different. However, God choosing bread to sustain them was not random. To see its significance, let’s fast-forward again to the New Testament. Jesus is the true manna—the bread that sustains for life. What was provided in abundance to the Israelites in the wilderness was a pointer to the One who is our daily bread. Once again, the Israelites were complaining, only this time it was of thirst. Angry at what they perceived as God not keeping his covenant promise to them, Moses was the one they revolted against. The consequence for a broken covenant is death, so in the courtroom scene of Exodus 17 the Israelites were ready to find him guilty and give him a death sentence. But to gently remind the Israelites once again of his faithfulness, God told Moses he would stand before him on the rock Moses was to strike. It was as if God said, “Bring the judgment on me.” When water gushed out after Moses struck the rock, we are again pointed to the New Testament. If you recall, Jesus’ last words as he hung on the cross after all had been finished were, “I thirst.” Soon after, when the soldier pierced Jesus’ side it was water (not blood) that came out. Jesus went thirsty for the Israelites and us and took the penalty for covenant unfaithfulness that we deserve. Because he did, we drink from the waters of his grace that flow from the ultimate hard place—the cross. Significant detail was given to the Israelites about how to build the tabernacle. So much information about colors, dimensions, materials, arrangements, even the tools to use, we tend to skip over much in the way we do the genealogy lists because they seem tedious. But it wasn’t to God. Every specification, every item, every everything tells us something about how God wanted to be worshipped. He is central to all of life as the tabernacle was central. Therefore, God’s presence was constantly before the people with reminders hitting all their senses. Consider even how the stench of the ongoing sacrifices would remind the Israelites of God’s presence and centrality. In Hebrews 8, the tabernacle, the priest, the Law and sacrifices are called copies and shadows. The Israelites were able to enjoy fellowship with God through his dwelling with them in the tabernacle—but not fully. What we see in Exodus with the tabernacle, the mediation of the priests and the sacrificial system is an incomplete picture, a pointer toward what is to come. John 1:14 tells us upon Jesus’ arrival, “The Word became flesh and dwelt among us.” The Greek word here for dwelt is tabernacled. In other words, Jesus is the true tabernacle and through him God dwells fully with his people. After the Israelites were found bowing down to a golden calf, Moses feared the absence of God’s presence. Desperately wanting to know he still had God’s favor, Moses pleaded with God to show him his glory. So, God took Moses up to a cleft in the rock and said all of his goodness would pass before Moses, but since no man could see God’s face and live, he would have to cover Moses until he had passed by. Despite Moses not getting God’s face, he glimpsed enough of God’s glory to be visibly changed by it. The Hebrew word panim used in Exodus 33 and 34 for “presence” and “glory” is synonymous with “face.” But the reason Moses did not get to see God’s face is because only later at the cross would the full radiance of God’s glory be displayed in the face of another man who had God’s back. This time it was God’s own son that he turned his back on. His son is the one who bore God’s judgment of sin, in order that we could have God’s face. One more skip ahead to the New Testament, this time in Luke 24 when Jesus appeared on the road to Emmaus after his resurrection. Jumping into the conversation between the travelers over Jesus’ death and their dashed hopes that he was the Messiah, we read, “And beginning with Moses (the first five books of the Bible) and all the Prophets (the rest of the Old Testament) he interpreted to them in all the Scripture the things concerning him” (Luke 24:27). We have now seen five places we may have missed Jesus before. As we approach God’s Word as the one unfolding story about Jesus, instead of viewing it as disjointed bits of advice and rules, is when it becomes for us the “manna” we need. This is why Exodus! Happy hunting in your continued search to see him in it. “For the law was given through Moses; grace and truth came through Jesus Christ” (John 1:17) who is visible throughout all of God’s Word. * Portions of the article were adapted from The Gospel-Centered Life in Exodus for Teens © 2018 New Growth Press. Kristen Hatton is the New Growth Press author of The Gospel-Centered Life in Exodus for Students, Face Time: Your Identity in a Selfie World and Get Your Story Straight. In addition to her own blog, she frequently contributes to the Rooted Ministry and PCA Women’s enCourage blogs, and recently started Redemptive Parenting on Instagram. Kristen lives in Oklahoma with her pastor husband and is the mother of three teenage/young adult children. Learn more by visiting her website at www.kristenhatton.com. NEXT: What Year Was Jesus Born?